Wing span: 1 3/8 - 1 5/8 inches (3/5 - 4.1 cm). Identification: Upperside of forewing is dark on the basal half and lighter on the outer half, with a distinct orange-brown patch at the end of the cell. Male has a costal fold containing yellow scent scales; female has a patch of scent scales on the 7th abdominal segment. Flight: Two broods from late April to early June and from July to August. Caterpillar hosts: Usually wild indigo (Baptisia tinctoria), but also others including wild blue indigo (B. australis), lupine (Lupinus perennis), false lupine (Thermopsis villosa), and crown vetch (Coronilla varia). Adult food: Nectar from flowers of blackberry, white sweet clover, dogbane, sunflower, crimson clover, and probably others. Habitat: Open woods and barrens for native hosts. Highways, railroad beds, and upland fields for the introduced crown vetch. Range: Southern New England and southern Ontario west to central Nebraska; south to Georgia, the Gulf Coast, and southcentral Texas. 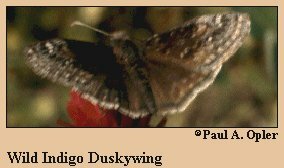 The Wild Indigo duskywing is rapidly expanding its range and abundance by colonizing plantings of crown vetch along roadways and railroad beds.